“Our Regional Outstanding Tree Farmers of the Year take this duty above and beyond. They not only have outstanding properties to show for it, but are spreading the word in their communities about the benefits of stewardship.” said Tom Martin, president and CEO of the American Forest Foundation. Today, the American Tree Farm System (ATFS) announced the four Regional Outstanding Tree Farmers of the Year from among more than 73,000 Tree Farmers across rural America: Jon and Carol Gould of Vernon, Florida; Russell Black of Wilton, Maine; Randy and Koral Clum of Dover, Ohio; and Dan Kingsbury of Olalla, Washington. Forests across the U.S. provide all Americans with essential resources, such as clean water and air, wildlife habitat, places to recreate and a wood supply for the products we use every day. The largest portion of these forests, or more than one-third, are owned by family forest owners. 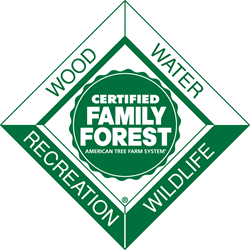 ATFS is an internationally-known recognition and certification program designed specifically for small family and private forest owners. The program provides these owners with tools and support to keep their forests healthy and sustainable – through a wide network and community of Tree Farmers and educational opportunities, rigorous Standards of Sustainability, and a third-party assessment process to certify land management practices. Collectively, there are nearly 20 million forested acres within the ATFS program nationwide. To be considered for the Outstanding Tree Farmer of the Year award, individuals must exhibit the most exceptional forest stewardship to protect and improve our forest resources, and must promote forest stewardship within their communities. Northeast Regional Outstanding Tree Farmer of the Year, Russell Black of Maine: Russell Black has shown a lifelong commitment to forest stewardship, beginning with working on his family’s land at the age of ten, and assuming ownership of the then 200-acre property in his early 20’s. Over time, Russell has acquired several surrounding tracts of land, bringing the total acreage of his Tree Farm to 500 acres. With more than 50 years of sweat equity in the land, he serves as an example of hard work and dedication to forestry. Today, the property is an active Tree Farm, cattle farm, and Maine maple syrup producer. To maintain the property, Russell conducts needed thinnings, has installed a large truck bridge, created pollinator habitat, has protected the frontage area of Pease Pond and much more. Not only is Russell very active on his family’s land, but he has taken his love and knowledge of good forestry beyond his property lines, being vocal in the state about stewardship. He has served as State Representative for his district for nearly eight years, using his experience to help inform the state legislature’s Agriculture, Conservation and Forestry Committee. He also is active in numerous local associations, and opens his property up for tours, education, recreation and more. Read more about Russell Black. North Central Regional Outstanding Tree Farmers of the Year, Randy and Koral Clum of Ohio: Randy and Koral Clum showcase how a profession can also be a lifelong personal passion and accomplishment. Both of them were foresters on Ohio’s Shawnee State Forest and then County Service Foresters, before leaving public forestry employment to operate their own business, Clum Forestry Consultants. In 1993, the Randy and Koral purchased their own 150 acre woodland, so that they could practice what they preached. They strive to create an example of the benefits of holistic, long-term forest care. They have been hands-on for all harvesting operations; choosing which trees to cut and which to leave as growing stock. They also keep a four-acre section of their Tree Farm undisturbed to illustrate the difference between managed and unmanaged woodland. The Clums love hosting forestry professionals, students, and others to discuss the different ways to manage your land for sawlogs, wildlife, water quality, aesthetics, and family fun. Randy refers to the farm as his Health Club. Koral tells others that she goes there to recover from nature deficit disorder. They feel blessed to have spent their lives helping spread the word about the rewards of Tree Farming. Read more about Randy and Koral Clum. Southern Regional Outstanding Tree Farmers of the Year, Jon and Carol Gould of Florida. The Goulds while they live in Birmingham, Alabama, own four Tree Farm properties, totaling 655 acres in the panhandle of Florida. Jon grew up helping his father care for his family’s forestland and in 1994, Jon and Carol started purchasing the Gould family Tree Farms, and two other overgrown and unmanaged tracts in the area as well. Together they set out to restore and keep these forests healthy. For more than 20 years, they have personally planted thousands of pine seedlings, conducted thinnings and harvests every few years, followed all silviculture best management practices and more. They have cared for many creeks, ponds and springs on the property, protecting the riparian areas and building culverts where needed. A big focus of their work has been on restoring and growing native longleaf pine – an important tree species for at-risk wildlife such as the gopher tortoise and the eastern diamondback rattlesnake. To keep the habitat thriving, they have conducted prescribed burns, created needed open spaces and encouraged the growth of grasses and other wildlife food sources. They are proud to have gopher tortoise burrows across much of the property, and in the past few years have seen the reappearance of the bobwhite quail on their land. The Goulds are active in spreading the message of good stewardship in their forestry community – hosting educational tours for school groups and landowners. Jon is on the board of the Florida Tree Farm Program, and they are long time members of the Longleaf Alliance. Read more about the Goulds. Western Regional Outstanding Tree Farmer of the Year, Dan Kingsbury of Washington: Dan Kingsbury’s leadership of his family’s 97-acre Five Springs Tree Farm has been paramount to its health and sustainability today. Taking over management of the Tree Farm in 1990, Dan has overseen the harvest of 1.8 million board feet on the property, controlled fast-growing weed species such as Scotch broom and black berry, and constantly pruned and cared for their trees to ensure top notch wood quality. Protecting water resources and salmon habitat are key focuses for Dan, with the property containing five natural springs and 11 acres that border the headwaters of the Purdy Creek. Dan has gone above and beyond the call of duty to protect his streamside areas to maintain high quality in the water that flows down to the Burley lagoon, an important resource for shellfish harvesters and fishermen. Community involvement and education are important to the family, with 11 acres open to the public as a Christmas Tree Farm, and the full property being part of tours and educational trips for elementary schools, churches, other landowners and more. Read more about Dan Kingsbury. One of these Regional Outstanding Tree Farmers, based on judging from AFF’s governance and online voting, will be chosen for the National Outstanding Tree Farmer of the Year award announced later this year.